Dinosaur Egg Fossil (yikes! please don’t make me eat that!). 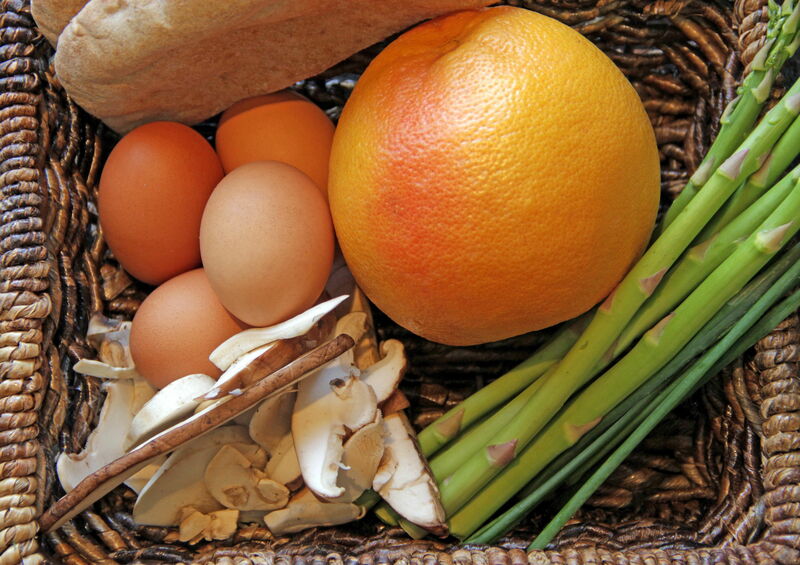 Well, the real Luis is my friend Luis Acevedo of Luis Acevedo Interior Design, and the real Eggs à la Luis is a healthy breakfast recipe I concocted just this morning. You see, I was having a bit of a design crisis, so I persuaded Luis to come over and help me out. He good-naturedly agreed to come first thing the next day. To me, this means breakfast must be served. Only trouble is, my usual impressive fanfare of crêpes, pancakes and waffles was not going to cut it, as Luis recently put himself on a strict diet. Thus, I decided to do some simple scrambled eggs jazzed up with lightly sautéed vegetables still with a bit of crunch. 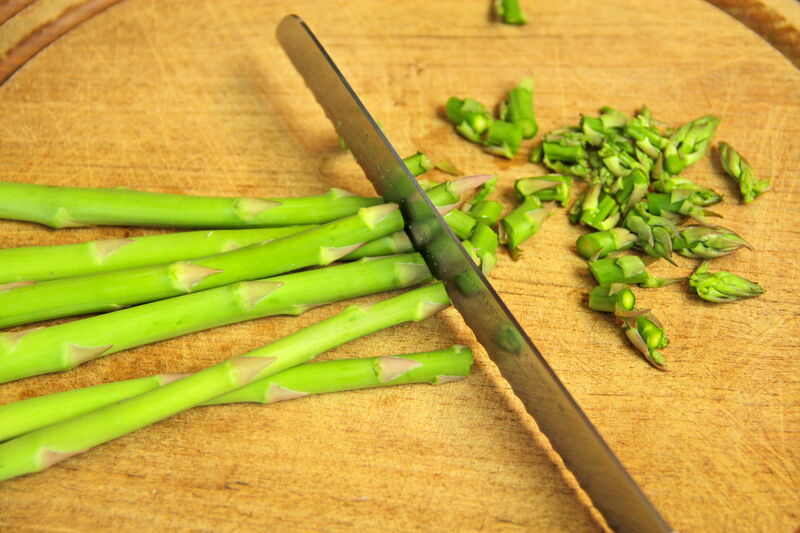 I chose asparagus for bright, fresh flavor and a wild mushroom assortment for texture and depth. A dusting of salt, fresh ground black pepper, and a pinch of spicy chives finished the eggs. 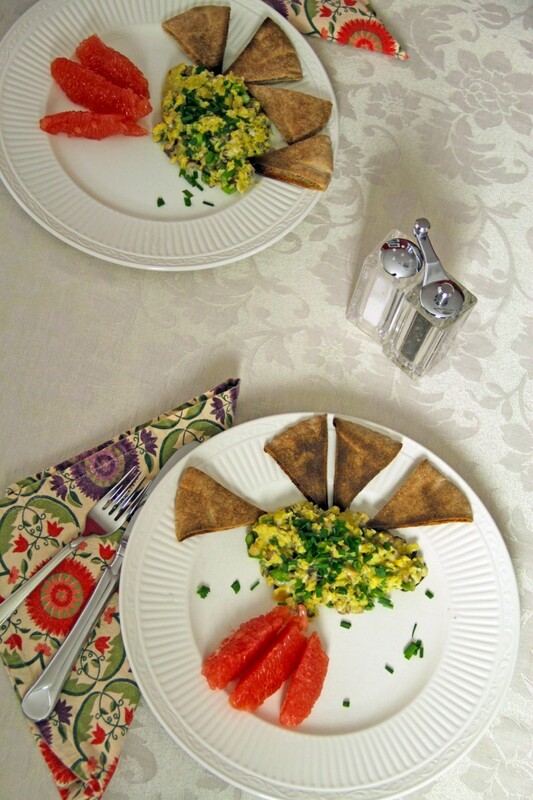 Crisped, whole wheat pita triangles served as cute, bite-sized shovels, just right for scooping up tiny gobs of savory eggs. Sweet, juicy grapefruit became a healthy mini-dessert. We enjoyed our Eggs à la Luis while working through my design solution. But you should have yours as a solution for breakfast in bed. Perhaps next time we google this will be on the top of the list! Heat olive oil in small, heavy pan over medium low heat. Add chopped asparagus and mushrooms to the pan and cook until gently cooked, about 3 to 5 minutes. Break eggs into a small bowl and whisk well. 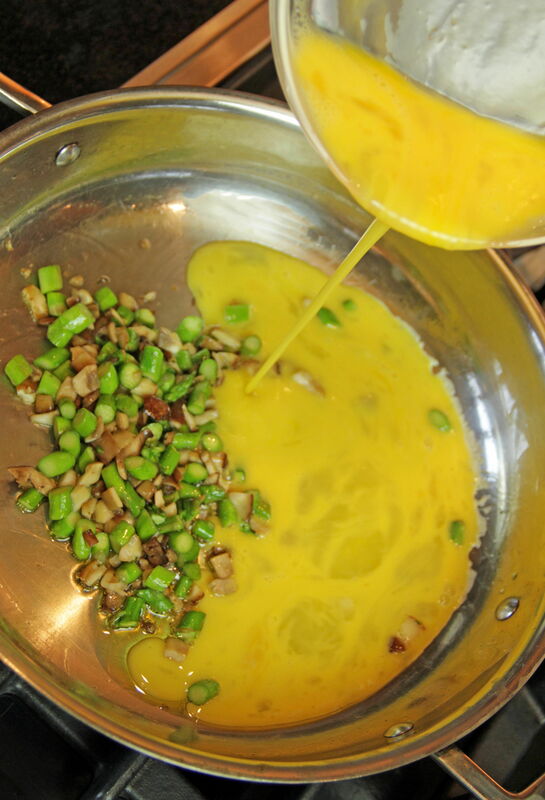 Add egg mixture to heated pan and allow to cook slowly and gently. Stir and lift frequently with wooden spoon to avoid sticking. Continue to cook until eggs are to your liking, another 3 to 5 minutes. Season with salt and pepper. Slice the pita bread into eight triangles. Place in toaster and toast until crispy. Peel and segment the grapefruit. If you like, peel off the grapefruit’s inner skin as well. To serve, place four toasted pita triangles onto each plate. 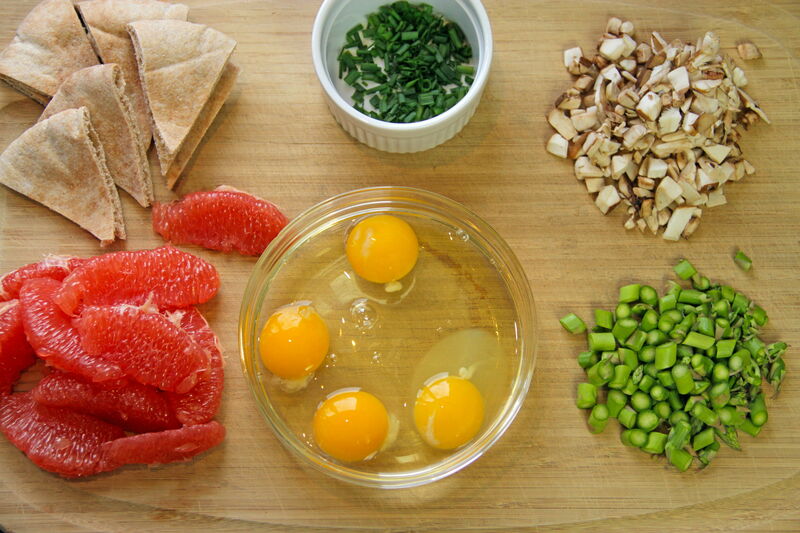 Divide the eggs equally onto each plate and top with fresh chives. 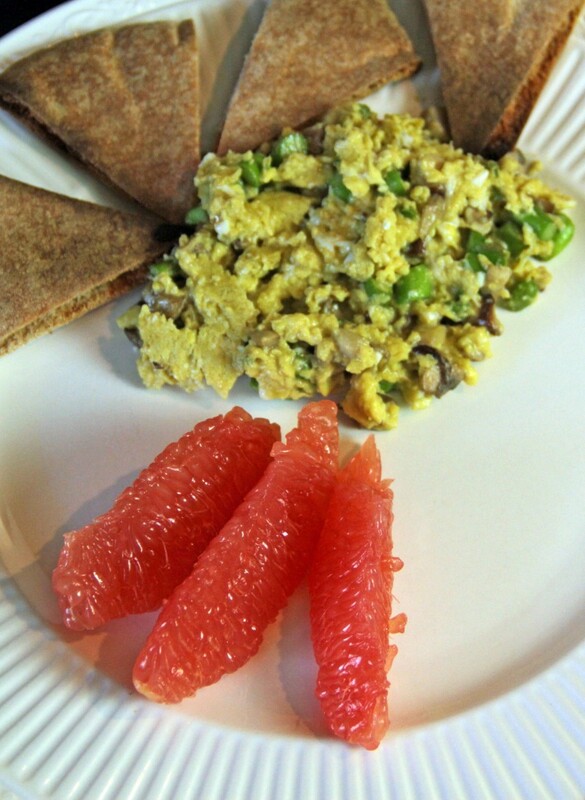 Add a few grapefruit segments to each plate and serve immediately.